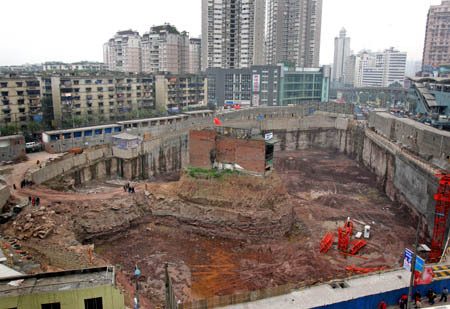 CHONGQING -- A Chinese couple's battle to stop developers from razing their home has finally come to an end with a negotiated agreement that nevertheless saw demolition of their house in southwest China's Chongqing Municipality begin on Monday evening. Wu Ping and Yang Wu, the owner of the only two-storey brick building still standing in the development zone, left their house on Monday afternoon, according to local sources. As compensation, they accepted an apartment in the Shapingba district of downtown Chongqing, similar in size to their old one, local sources said. Their former 219-square-meter house has been dubbed the "nail house" because it refused to be hammered down. The duo have been fighting off bulldozers there since 2004, when developers pleaded with them and another 280 households to make way for a shopping mall. But the compensation proposed by the developer -- 18,000 yuan (US2,308) per square meter -- fell short of residents' expectations. The other residents left one after another, leaving the building standing like a fortress surrounded by a 17-metre deep construction site. In the last couple of months it has been the focus of media attention. "I wanted to safeguard my dignity and lawful rights," said Wu Ping. Yang said that the house, formerly a wooden building and re-built in 1993, was handed down through several generations. It was used as a variety store and then leased to become a restaurant. A local court ruled on March 19 that the couple must move out of the house before March 22, but the furious Yang forced his way back into the house and took up residence there again. Wu brought him food, water and quilts. They were tied to a green rope so that Yang could pull them up to where he was, marooned in the house on top of a mound. While the husband flew a national flag to demonstrate his determination on the "island", his wife held "press conferences" for media and audiences on the construction site. Huang Yun, head of the Jiulongpo District where the house was located, said on Saturday that the local government would mediate and help resolve the dispute in a "fair, just and lawful way". Some local residents were sympathetic to the couple, but noted that "common people can't win against developers". "We shouldn't make trouble for the government," said Li Deshun, an old man living nearby. Experts believe that the outcry reflects a growing dissatisfaction among common people about the way sites are commandered and buildings demolished. On China's portal websites like sina, 85 percent of those polled showed support for the couple. China passed its landmark property law last month, highlighting the protection of private property. "Let's hope the new law reduces such disputes," said Zhao Wanyi, professor at the Southwest University of Political Science and Law. 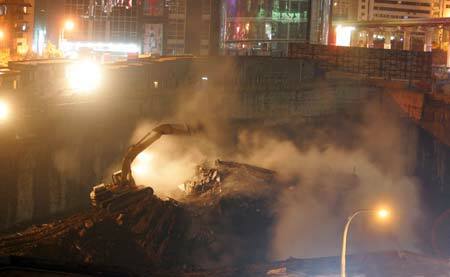 The demolition started at 7 p.m. Monday and is expected to last till about 2 a.m. Tuesday. The work is progressing slowly as the "nail house" yields inch by inch.